Which Creatinine and Cystatin C Equations Can Be Reliably Used in Children? Background and objectives Estimation of GFR in children is challenging; reference methods are cumbersome, and formulas have limitations. The aims of this study were to evaluate (1) the new creatinine-based formula recently proposed by Schwartz using a kinetic colorimetric compensated Jaffe technique; (2) some cystatin C-derived formulas (Hoek, Le Bricon, Larsson, Rule, Filler, and Zappitelli) using a nephelemetric technique; and (3) combined formulas using both cystatin and creatinine (Zappitelli and Bouvet). 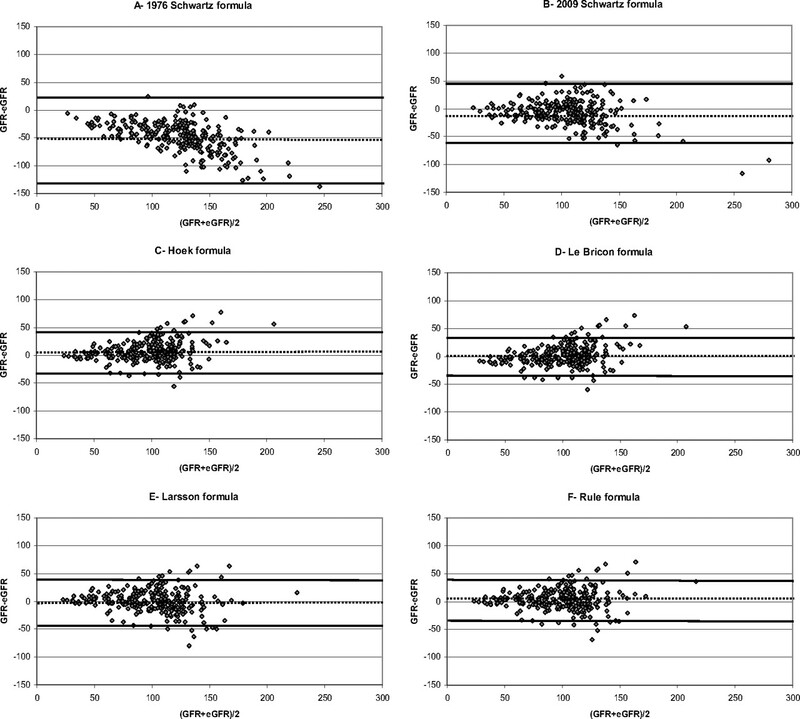 Design, setting, participants, & measurements These formulas were evaluated in a cross-sectional cohort of 252 children with moderate CKD or normal GFR, in comparison with the reference standard (inulin clearance, iGFR). Mean age, body weight, height, creatinine, and cystatin C were 10.7 ± 4.0 years, 35 ± 15 kg, 137 ± 20 cm, 55 ± 30 μmol/L, and 0.91 ± 0.35 mg/L, respectively. Results Mean ± SD iGFR was 101 ± 32 ml/min per 1.73 m2. When evaluating agreement between these formulas and iGFR (e.g. correlation, Bland Altman plots, bias, and accuracies), there was a good correlation between iGFR and all Le Bricon, Larsson, Rule, and Zappitelli (both) and locally adapted Schwartz and 2009 Schwartz formulas; by contrast, Filler and original 1976 Schwartz formulas overestimated iGFR, whereas Hoek and Bouvet formulas underestimated iGFR. Conclusion Different cystatin C-derived formulas (at least Larsson and Le Bricon) for estimating GFR as well as the Zappitelli combined formula are accurate in addition to the new Schwartz bedside formula in a general pediatric population. The reference method for assessing the GFR is the measurement of renal clearances of an ideal marker of glomerular filtration, i.e. a marker that is freely filtered through the glomerulus and neither secreted nor reabsorbed by the tubule (e.g. inulin, EDTA, and iohexol). However, these techniques based on exogenous markers are difficult to perform in clinical practice, because of their complexity and cost (1). Thus, plasma creatinine is the most commonly used marker of renal function worldwide, but it has strong limitations, e.g. its active secretion by the proximal tubule, its extrarenal elimination in case of severe renal impairment, and its relation to muscle mass (1). Serum cystatin C has been described to be a promising biomarker for evaluating renal function since 1985 (2–6), but a few authors have challenged this observation (7). Cystatin C is an endogenous low molecular weight protein fulfilling the criteria of the “ideal filtration marker”: it is produced at a constant rate and freely filtered without tubular secretion but with a complete proximal catabolization after reabsorption (8). Cystatin C also seems to be independent from body weight (BW) and height in children (6). For gender, the results are more contradictory (6,9). However, several limitations for serum cystatin C have been discussed: its extrarenal elimination (however of unknown amplitude), its likely increase in case of chronic microinflammation, its increase while on glucocorticoids (in a dose-dependent manner), and its modification in patients with thyroid dysfunction and diabetes (10). Many formulas for estimating GFR have been proposed mainly in adult populations, using plasma creatinine (e.g. Cockcroft and Modification of Diet in Renal Disease formulas) or serum cystatin C (e.g. Hoek, Le Bricon, Larsson, Rule, Filler, and Zappitelli formulas); however, each equation has been developed for a specific population, and it is difficult to extrapolate these formulas in other populations (11–19). Moreover, some combined formulas using both creatinine and cystatin have also been proposed (11,20,21). In pediatric populations, the original and the modified Schwartz formulas derived from plasma creatinine are widely used. However, because of the wide interlaboratory variations of creatinine measurements (22), the Schwartz formula should be locally adapted according to the local creatinine assay, but this is rarely performed in clinical practice (6,23,24). In 2009, Schwartz et al. (20) reported a new bedside estimation of GFR (eGFR = 0.413 * height (cm)/creatinine (mg/dl) or eGFR = 36.5 * height (cm)/creatinine (μmol/L)) that was strongly correlated to GFR measured by iohexol clearance in a cohort of 349 North American children with mild to severe chronic kidney disease (CKD) and notable growth retardation. However, these authors pointed out the importance of validating this bedside formula in children with higher GFR and without growth retardation. Moreover, whereas cystatin C is a less easily used biomarker of renal function, many different formulas have been published, potentially confusing the general pediatricians. Thus, the aims of this study were (1) to evaluate this new formula on the basis of creatinine plasma levels and (2) to evaluate the previous published cystatin C-based or combined formulas in a cross-sectional cohort of French children with moderate CKD or normal GFR and without significant growth retardation. These results were compared with the GFR assessed with the reference standard, i.e. inulin clearance (iGFR, expressed in ml/min per 1.73 m2). We therefore hypothesized that the new Schwartz and some cystatin C-derived and combined formulas could work in a general pediatric population to help clinicians in their daily practice. Different formulas estimating the GFR with creatinine and cystatin C were compared with the results of inulin clearance (iGFR) in a prospective cross-sectional cohort of 252 French children. Children were issued from two different clinical studies (a study evaluating the renal prognosis of children born very preterm and a study evaluating FGF23 metabolism in children with CKD) that were approved by a local ethical committee (25,26). Table 1 summarizes all of the formulas used for the estimation of GFRs. Different groups according to age were defined: less than 10, between 10 and 15, and more than 15 years of age. The causes of CKD, as well as main therapies (i.e. corticosteroids, calcineurin inhibitors, anti-metabolites, and angiotensin-converting enzyme inhibitors) were recorded. Height and BW were expressed in absolute values and in standard deviation scores (SDS), according to French pediatric growth charts (27). Growth retardation was defined by a height and/or BW below −2 SDS. Plasma creatinine was obtained from a kinetic colorimetric compensated Jaffe technique (Roche Modular, Meylan, France; compensation according to manufacturer's recommendations) and serum cystatin C from a nephelemetric technique (BN2; Behring, Paris, France). We had previously checked that the Roche compensated method closely agreed with an enzymatic Roche method, as summarized in Figure 1. Comparison between plasma creatinine measured with an enzymatic Roche method and with a compensated Jaffe technique (n = 199 adult patients, mean ± SD = 130.2 ± 1.7 μmol/L, R2 = 0.997, P < 0.05). (A) Univariate relationship. (B) Bland and Altman plot (mean ± SD for the difference = 3.9 ± 7.4 μmol/L). The real GFR was measured by the clearance of inulin (polyfructosan infusion, Inu test®; Fresenius Kagi, Graz, Austria). A standard technique was used by a trained staff with a continuous infusion after a priming dose of polyfructosan (30 mg/kg). Water diuresis was induced by oral administration of 5 ml/kg of water followed by 3 ml/kg every 30 minutes combined with an intravenous infusion of 0.9% sodium chloride. This enabled the patients to spontaneously empty their bladder every 30 minutes. Three to four urine samples were collected, and a blood sample was drawn mid-way through each collection period. The clearance values were obtained from the mean values of the three to four 30-minute clearance periods. Patients needing intermittent urethral catheterization were excluded from this study. To obtain valid results in patients with mild urologic abnormalities, polyfructosan was diluted in mannitol 10%, and water diuresis was induced before the arrival of the patients; thus, the increase of urine volume and the secondary decrease of urinary concentration of inulin allows minimization of the errors caused by mild urological problems, by allowing a diminution of sample variability and a facilitation of vesical voiding. In addition, whatever the pathology of the patient, a maximum scatter of 20% between the three or four clearance periods was accepted to assess the validity of GFR measurement in each period. Measurements of plasma and urine polyfructosan were performed using an enzymatic method (28). The results were expressed to 1.73 m2, according to the Dubois formula of body surface area (BSA): BSA = height0.725 * weight0.425 * 0.007184. Statistical analysis was performed with the SPSS software® 16.0 for Windows. The following tests were performed to evaluate the agreement between methods used to calculate estimated GFRs (eGFRs) (29): (1) calculation of an univariate correlation coefficient using Spearman correlation; (2) calculation of the difference between iGFR and eGFR (means ± SD), of the accuracies (10, 30, and 50%), and of the absolute bias (i.e. average difference between eGFR and measured GFR); (3) comparison of the eGFRs to inulin clearance with the Wilcoxon paired test; and (4) Bland Altman charts. To better define the distribution of serum cystatin C in the population (e.g. to study its distribution according to gender or age), we compared cystatin C in different subgroups to search for differences. Multicomparisons were performed with an ANOVA test for parametric variables and with Kruskall Wallis test for nonparametric variables. Dichotomized variables were compared using the Pearson X2 test. All of the statistical tests were performed at the two-sided 0.05 level of significance. The data are presented as the means ± SD. 252 patients were evaluated (132 boys), as summarized in Table 2. Mean ± SD age, BW, and height were 10.7 ± 4.0 years (range 4.4 to 19.9), 35 ± 15 kg, and 137 ± 20 cm, respectively. Mean ± SD SDS for BW and height were 0.2 ± 2.1 and −0.2 ± 1.4, respectively. Thirty-two children presented growth retardation for BW, 20 presented growth retardation for height, and 12 showed combined growth retardation. Forty patients received cyclosporine A, 34 tacrolimus, 61 mycophenolate mofetil, 11 azathioprine, 58 prednisone, and 38 angiotensin-converting enzyme inhibitor or angiotensin 2 receptor antagonist. The indications of inulin clearance were the following: solid organ transplantation (42 kidney transplantation, 14 liver transplantation, three combined kidney/liver transplantation, and five heart transplantation), bone marrow transplantation (n = 7), glomerular disease (n = 7), nephrotic syndrome (n = 10), congenital abnormality of the kidney and the urinary tract (n = 36), solitary kidney (n = 18), hemolytic and uremic syndrome (n = 11), Henoch Schönlein purpura (n = 3), polycystic kidney disease (n = 5), tubulopathy (n = 5), Alport syndrome (n = 5), history of prematurity (n = 44), metabolic disease (n = 7), hematologic disease (n = 9), nephrotoxicity (n = 13), and miscellaneous indications (n = 8). Mean ± SD plasma creatinine and serum cystatin C levels were 55 ± 30 μmol/L and 0.91 ± 0.35 mg/L, respectively. Mean ± SD (median) iGFR was 101 ± 32 (105) ml/min per 1.73 m2. Mean ± SD eGFRs obtained with the different creatinine- and cystatin C-based formulas are summarized in Table 3, as well as means ± SD (iGFR-eGFR), accuracies (10, 30, and 50%), and univariate correlation coefficient between iGFR and eGFRs. Figure 2 corresponds to the different Bland Altman plots for each formula. When correcting the Larsson formula for BSA, there was an important overestimation of iGFR (means ± SD for eGFR: 169 ± 69 ml/min per 1.73 m2; means ± SD for iGFR-eGFR: −69 ± 62 ml/min per 1.73 m2). When correcting the Bouvet formula for BSA, there was also an important overestimation of iGFR (means ± SD for eGFR: 127 ± 38 ml/min per 1.73 m2; means ± SD for iGFR-eGFR: −26 ± 24 ml/min per 1.73 m2). When analyzing results between children with a past of solid organ transplantation and those without a past of solid organ transplantation, there were no obvious differences for the accuracies of the different formulas. Bland Altman plots of the different formulas (eGFR) in comparison with inulin clearance (GFR). (A) 1976 Schwartz formula. (B) 2009 Schwartz formula. (C) Hoek formula. (D) Le Bricon formula. (E) Larsson formula. (F) Rule formula. (G) Filler formula. (H) Zappitelli formula. (I) Combined Zappitelli formula. (J) Bouvet formula. GFR and eGFR values are expressed in ml/min per 1.73 m2 (except for E and J). The solid lines correspond to the mean of GFR-eGFR ± 1.96 SD. The dotted line corresponds to the mean of GFR-eGFR. When comparing in the total cohort the results between boys and girls, although there was no difference for age (10.6 ± 4.0 versus 10.8 ± 4.0 years, P = NS), body weight (35 ± 16 versus 34 ± 15 kg, P = NS), height (138 ± 21 versus 136 ± 18 cm, P = NS), and iGFR (100 ± 32 versus 102 ± 32 ml/min per 1.73 m2, P = NS), both plasma creatinine and serum cystatin C were significantly greater in boys (58 ± 32 versus 51 ± 27 μmol/L, P = 0.013 and 0.94 ± 0.35 versus 0.87 ± 0.35 mg/L, P = 0.014, respectively). When comparing the results according to age in children with normal GFR and in children with CKD, plasma creatinine was greater in older children, whereas serum cystatin C levels were not modified by age. These results are summarized in Table 4. In this study, we have evaluated the external validity of several published bedside formulas based on plasma creatinine or serum cystatin C in comparison with the reference method in a French pediatric cross-sectional cohort of 252 patients whose clinical characteristics were known, e.g. indication for renal exploration, therapies, and anthropometric parameters. The main findings of this study are (1) the demonstration of the validity of the 2009 published “new bedside Schwartz” formula in a population with different characteristics than the original one, mainly in terms of GFR and growth (20); (2) the prospective validation of a “locally adapted” Schwartz formula when using a kinetic colorimetric compensated Jaffe technique; and (3) the demonstration of the reliability of several different cystatin C-derived and combined formulas in a general pediatric population when using a nephelemetric technique (11,14–16). Many equations based on plasma creatinine and/or serum cystatin C have been previously proposed, with different assays; however, each equation has been determined for a specific population (and not necessarily pediatric patients), and the external validity of such formulas should be evaluated. When evaluating agreement between all of these formulas and iGFR, there was a good agreement between iGFR versus the Le Bricon, Larsson, Rule, Zappitelli (cystatin-derived and combined), local Schwartz, and 2009 bedside Schwartz formulas; by contrast, the Filler and 1976 Schwartz formulas overestimated iGFR, whereas the Hoek and Bouvet formulas underestimated iGFR. The overestimation of iGFR by the 1976 Schwartz formula has been previously investigated and has been attributed to the change in creatinine assays since the development of the first formula in the 1970s (20). Indeed, the original formula was developed using an end-point Jaffe reaction, whereas the 2009 one depended on an isotope dilution-mass spectrometry (IDMS) referenced enzyme assay. The need for a local specific correction of the k has been well demonstrated (24), but this correction is rarely performed in clinical practice (6). Ongoing international calibration for all assays with IDMS could reduce the systematic bias between the different methods (e.g. colorimetric or enzymatic methods), but it is not yet universally performed (6). The 2009 Schwartz formula is very close to our locally-adapted formula, but it does not take into account age, especially in boys (20,24). Indeed, Schwartz et al. developed this formula in a cohort of 349 North American children with mild to severe CKD (median GFR 41 ml/min per 1.73 m2) and notable growth retardation (median percentile for height, 23%). Thus, they could not divide their population into subgroups according to age (< or >13 years, as they did in their previous 1976 formula), because most of the children presented significant delayed pubertal maturation. Thus, they discussed the need of an external validation of this formula in children with greater GFR and no significant growth retardation. Our cohort corresponds to “ambulatory” pediatric nephrology patients: for many patients inulin clearance is performed to evaluate medical conditions with a “renal risk” but no overt CKD or nephropathy (e.g. follow-up of severe prematurity, solitary kidney, nephrotoxicity, etc.). In these conditions, the mean iGFR belongs to the normal range, in children without growth delay. Thus, the results obtained in this study validate the 2009 bedside Schwartz formula in a general pediatric cohort, independently of the transplantation or the corticosteroids status. It is also interesting to note that the formulas seem more efficient when the GFR was below 90 ml/min per 1.73 m2; this could probably be explained, as least partly, by a more important magnitude of GFR in the group with a GFR above 90 ml/min per 1.73 m2. Of note, results were similar in the recent paper published by Staples et al. (30), evaluating the new Schwartz formula in comparison with iothalamate in a cohort of children aged 1 to 16 years. Additionally, six different cystatin C-based formulas and two combined formulas have also been evaluated in this study with a nephelemetric method for cystatin C measurement. In this study, we wanted to evaluate available formulas for a use in “clinical daily” practice; therefore we have taken many published formulas and compared them with inulin clearance. In this study, even although the majority of formulas seem accurate to evaluate GFR with a nephelemetric method to measure cystatin C in a general pediatric population, their use may be limited because of their cost. In the era of computers, these quite complicated formulas can, however, be used more easily than previously. The estimation of GFR in children remains challenging in daily practice: even though the Lund strategy appears to give interesting and reliable results in adults, to date in children there is no real consensus. Briefly the Lund strategy consists of a multi-step evaluation of GFR: (1) simultaneous calculation of eGFR with one creatinine-derived formula and one cystatin-derived formula; (2) in case of agreement between the two equations, the mean value is considered to be the reliable GFR; (3) in case of disagreement, clinical charts are reviewed; (4) if an explanation for the disagreement is found (e.g. abnormal muscle mass or large doses of corticosteroids), the formula known to be influenced is removed; and (5) if no explanation is found, an invasive evaluation of GFR using the gold standard is then performed (31). With our results, we can probably conclude that the 2009 Schwartz, the Lebricon, and the Larsson formulas can be used reliably in a general pediatric population, all the more because there were no significant differences between inulin clearance and these two cystatin-derived formulas in this cohort. Moreover, the combined formulas do not seem to bring additional values to these equations. Unfortunately, the last combined formula proposed by Schwartz has not been evaluated because the value of BUN was not available. Another finding of this study is the characterization of serum cystatin C according to gender and age: cystatin C remains stable with age, whereas boys have greater serum cystatin C levels than girls, suggesting the need for gender-based normal values, as described previously by Groesbeck et al. (9). However, these authors also found decreased serum cystatin C levels with age, mainly in girls, in their cohort of 719 American teenagers; by contrast, Bökenkamp et al. (32) found that cystatin C was independent of age and height in a cohort of 184 children. In younger children (i.e. under the age of 18 months), Fischbach et al. (33) showed a negative correlation between age and cystatin C, reflecting the immature renal function in this age group. Thus, the initial objective of this study was to evaluate creatinine- and cystatin-derived formulas, as well as combined formulas in a general pediatric population, to help physicians in daily practice to assess renal function in their pediatric patients. We could have studied patients receiving corticosteroids independently (i.e. mainly patients with a past history of solid organ transplantation or nephrotic syndrome), because it has been well demonstrated that corticosteroids could influence serum cystatin C levels but in a dose-dependent manner. However, because the mean daily dose of corticosteroids was 3.5 mg, with only eight children receiving 5 mg a day or more, we therefore considered that these daily posologies were low, and we did not analyze data according to the “corticosteroid” status. In addition to the validation of the 2009 Schwartz formula in a general pediatric population, we have also demonstrated that most of the cystatin C-derived formulas for estimating GFR seem accurate in nonselected pediatric patients (and mainly two formulas: the Larsson without correction for BSA, and the Le Bricon one). The international standardization of creatinine assays with the IDMS method will probably improve the accuracy of “universal” creatinine-based formulas (34), but to date, these cystatin C-derived formulas can be used reliably when reference methods for measuring the true GFR are not available or when the local adaptation of Schwartz formula has not been performed. The preliminary results of this study were presented at the 43rd Congress of the European Society for Pediatric Nephrology (Birmingham, United Kingdom, September 2 through 5, 2009) and at the Société de Néphrologie Pédiatrique (Montpellier, France, November 19 through 21, 2009). You are going to email the following Which Creatinine and Cystatin C Equations Can Be Reliably Used in Children?